Living Rivers showcases some of the greatest river systems of the world including the Rio Grande, the Amazon and the Mekong. It’s estimated that 80% of all pollution in our oceans comes from land-based activities via rivers and land run-off, so in Deep Blue One we bring to life the world’s greatest river systems and their surrounding habitats to show the intricacies of life for their inhabitants and how closely they affect one another. Through a series of live exhibits – both aquatic and terrestrial – you are able to get a true feel for life in and around tropical rivers. Test your wits against the man-made threats of the Amazon River in our game, Piranha Peril. Get up close to natures natural scuba divers and follow our Leaf cutter ants as they journey to and from their nest. The exhibit is brought to life by carefully chosen exotic species including Red-bellied piranha, an Amazon tree boa and the Critically Endangered Golden mantella frog. 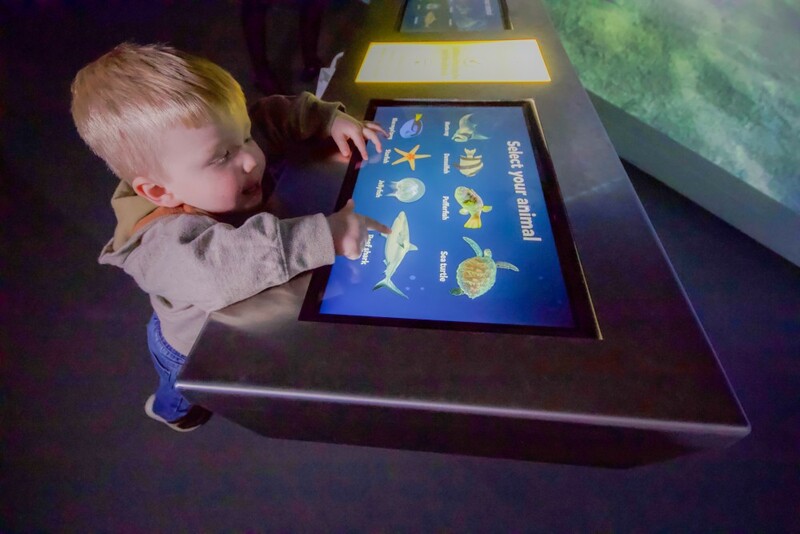 Don't forget to create your own creature in our Digi:Sea! Go crazy with colour and watch your creation come to life within the digital ocean around you. Younger children (under 1m in height) can also take advantage of our marine themed soft play area down in Deep Blue One. Please note, parental supervision is required at all times. Here you can see some of the stars of Deep Blue One, so make sure to look out for them on your way round. These fish are said to be one of the most ferocious freshwater in the world! Their short jaws are lined with razor sharp teeth, well able to take a bite out of much larger fish. This strange looking creature is not a fish but an amphibian, descending from what were once terrestrial salamanders – effectively evolution in reverse! Although completely aquatic, they still have lungs, and breathe primarily through their prominent feather-like gills. The Milk frog is a large species of frog which can grow up to 10.2cm. As they age, their skin develops a slightly bumpy texture. The "milk" in the common name comes from the milky fluid these frogs excrete when stressed. Amazon Boas are nocturnal hunters. This highly aggressive constrictor strikes it prey using its long sharp teeth, coiling around it and squeezing with its muscular body before swallowing it whole. These fish get their name from the figure of eight pattern on their back, which is camouflage avoid birds and other predators. These snakes can grow up to 5ft in length, with females growing larger than males. They mostly hunt within the water and have a lifespan of around 20 years. An endangered species, the killifish is isolated to the lakes of Madagascar where they live amongst the roots of underwater plants. They can be found nowhere else on the planet. These crabs owe their name to their spooky appearance. They have established a life both on land and within freshwater habitats and is now totally independent of the sea. These natural "scuba divers" are able stay underwater for several minutes at a time, breathing with the help of a tiny bubble of air that they collect at the water's surface.